Samuel Bayer is an award winning film and video maker, known for his cutting edge look, story telling and ability to bring the extraordinary to life. He has shot and directed videos for The Strokes, Nirvana, Hole and Green Day. Bayer won the MTV Video Music Award for Best Direction in 2005 and 2007 among many other awards. Bayer and his designer Joseph Gilbert enlisted Quadshot Software in 2012 with the desire to not just show his videos in a unique fashion, but to also showcase his other passion, photography. Built with presentation in mind and targeted to industry professionals, the site features various ways to mix and sort film and video. Built on WordPress with a custom front page Sliding Gallery that Samuel has full control over images (size, re-size and look), content linking and text if desired, custom navigation and ease of use via custom shortcodes. Some other fun features are the “link fade” animation, custom sort via Custom Post Types and Taxonomy with an opacity overlay, and a nice use of Custom Post Types for the portfolio sections. Although most work is custom, we did get to use Posts To Posts (props to Scribu and Ciobi for their excellent work. Posts To Posts allows Samuel to create Awards as one entry and Video as another and easily associate entries without doing any additional “copy and paste” work. To learn more about Samuel Bayer, visit Wikipedia/SamuelBayer. 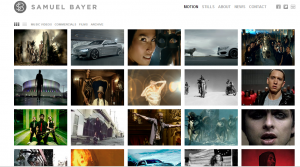 Quadshot Software is pleased to announce the launch of www.samuelbayer.com.